I thought many of the NSW Tatters' Guild members would be entering their tatted pieces to the 125th Castle Hill Show in April this year. But I was wrong.!! As a member, I haven't been contributing much to the Guild mostly because of my commitments to both work and home. So, I have decided to take this opportunity to contribute and have been madly tatting up a storm in my spared time during the past week. I needed to hand the tatted pieces to the Guild's Show Director this afternoon, so have finished the sixth piece this morning and I'm tatted 'out'.!! 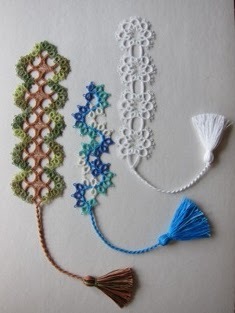 In total, I have tatted 3 small doilies and 3 bookmarks. 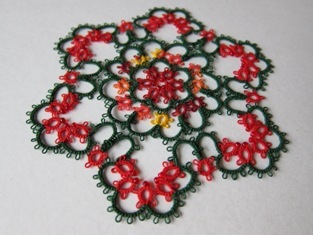 I have mixed and matched the designs to make them my own and have given each piece a name to make it easy to refer to. 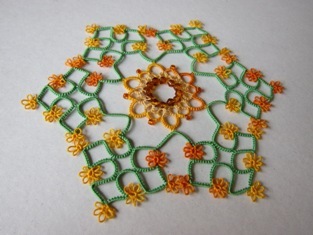 In the process, I have found myself enjoying tatting with beads. They add dimensions to the pieces, I think. 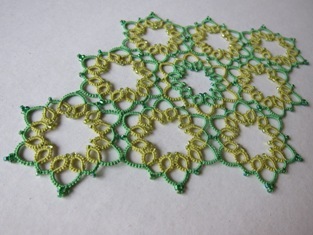 I'm now getting on with my quilt and hope to finish it in time to enter to the Sydney Quilt Show. The Show is in June but the closing date for entries is in 2 weeks (11th March 2011), the day before I fly to Seattle, WA, for GHME 2011 Conference. My toes are tightly crossed, my fingers are very busy sewing, my brain is sorting through the tasks to be done for work, and I'm loving it all. Absolutely Definitely My Favourite Apron ! !